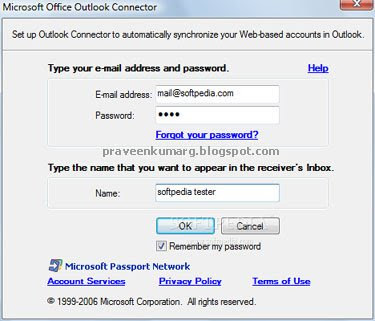 With Outlook Connector, you can use Outlook 2003 or Outlook 2007 to access and manage your Windows Live Hotmail or Office Live Mail accounts, including e-mail messages and contacts for free! Calendar, tasks and notes can also be accessed and managed in Outlook for accounts with a paid subscription. ￭ Read and send your Office Live Mail/Windows Live Hotmail e-mail messages. ￭ Manage your Live Mail Contacts. ￭ Use advanced options for blocking junk e-mail messages. ￭ Manage multiple e-mail accounts in one place. ￭ Manage, share, and synchronize your Windows Live Calendar in Outlook. ￭ Access your Tasks and Notes.